Here is a view out my apartment front door today, we have a blizzard warning! So my daughter is staying home and we aren't watching the baby today. As they say, "ain't nobody goin' nowhere". We have about 5 inches (13 cm) with more coming. Winds are around 30 mph, blizzard conditions are sustained winds of 35 mph, so we are close to being an honest to gosh blizzard. Luckily the driveway for the house got poured on Monday, so it's curing nicely. I'm still down with bronchitis, as the first batch of antibiotics was completely ineffective. I saw the doctor on Monday, and the new batch he prescribed are definitely having an affect. I feel much better and the cough isn't nearly so frightful as it was last week. I finally finished tatting the sample of Lizbeth tatting thread that Handy Hands sent me with an order last year. The sample was Size 20, color #184 Rainbow Splash. I tatted these items from "New Tatting" by Tomoko Morimoto. The large bookmark at the top was last, and should only have three motifs in it. However, as I tatted, I realized I could keep going, so managed to tat five motifs in all. I had only 1 1/2 ft of tatting thread left, so that cut it close! I used DMC Cebelia Size 30 in Ecru as the ball thread. I find I don't like Cebelia as a tatting thread, it's a bit on the soft side compared to the Lizbeth. I gave away all the other colors I had to the ladies in my tatting group, and will bring the rest of the ecru next week. Some of the other ladies love it, so they can have it. I found that it is a waste of time to try to tat (or embroider, or sew, etc) with something I really don't like. After all, this is supposed to be fun. So I have been trying to give away the things I don't like, and usually someone else is very happy to have it. I plan on working on the Grandmother's Flower Garden Quilt today, maybe I can get another border finished. I've done two, only two more to go. Sunday was my QA inspector's first birthday. 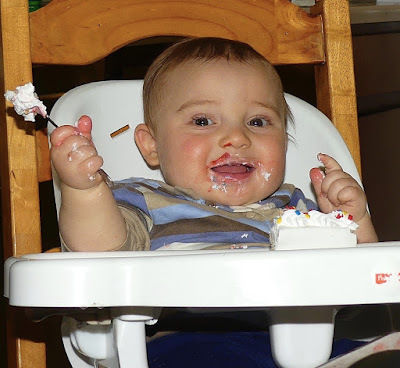 He certainly likes his birthday cake. We are making progress on the house. You can see where the refrigerator goes on the right, and the space in the base cabinets for the stove to the left. The big blank spot in the center right is where the microwave goes, right under the counter. The cabinet people measured it wrong and it has to be remade. It was supposed to be here a few days ago, but it's not here yet. I love the way the desk area came out. There will be plenty of room for a computer and a printer. Two sets of outlets will make plugging everything in pretty easy. The center is the ethernet connection. I had them installed in about 6 places so we don't have to rely on in home wireless. Downstairs, the workers are measuring and cutting the vinyl for the sewing room floor. I didn't want to put hardwood in what is essentially a work room, so I opted for a very nice vinyl. Safety is an issue here. I'm always looking for pins and needles that I drop, and the hard flooring is a much safer option than carpet. If I want to convert the room back into a bedroom, it will be a snap to lay carpet down right over the vinyl. We had snow yesterday, so the pouring the concrete driveway is postponed for a few days. We are supposed to close on the house on April 12, less than a month away! Nice, lacy pattern, if I just follow the directions! Since I finished the last hanky, I've been searching around for more edging patterns. I don't want really complicated ones, but something a bit more lacy, with plenty of picots on the rings. And ones with corner patterns. I'm not experienced enough to design my own, but with time I might be able to. I like this one, which I modified from another pattern, especially if I do it correctly. You can see the wonky ring on the cloverleaf two down from the corner. This one is a bit harder, as I need to work on getting the slack eliminated from the rings. I'll practice a bit more and make the picots larger. I have some lovely Liberty of London fabrics that I bought during our last trip to London in September, 2014 to make the hankies from. I'm also using DMC Cordonnet size 80, real tatting thread, for these. The Hardanger project is on hold for a bit. I had some trouble with making the picots on the sides of the needle bars, and need some instruction. Luckily, I have resources. The owner of the needlework shop we frequent in Greeley is quite good in this and is available during our Stitch and Sit sessions on Tuesdays, and several of the Tatting ladies are experienced in Hardanger. They have all offered to help. What lovely ladies! The Grandmother's Flower Garden quilt is coming along slowly. Right now I'm working on the borders, a boring job if ever there was one. I'll show it when there is something significant to show. The Mystery Quilt is also on hold, as I only can work on one quilt at a time. I showed you my sewing space in this post, and it's pretty tight. There has been quite a bit of activity on the house lately, thank goodness! We meet with a landscaper in the morning, so I should have some photos tomorrow. We are due to close on it April 12, less than a month away. I am so anxious to get into it. Grandma, why won't you hold me? Here is is listening to old 50's rock songs on my phone. He will be a year old on Sunday. I can't wait to decorate the grandchildren's room in the house. It's almost 9 pm and I'm ready for bed and another dosage of codeine. My cough was so bad I was given the pain relief dosage, which is almost three times the normal cough suppressant dosage. So I've been under the influence and not able to do much at all. I've been tatting a bit, lately and made a tatted edging for a linen hanky that I also made. 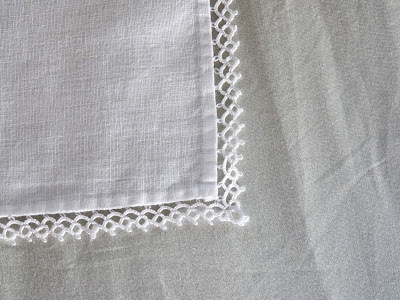 The linen is very fine handkerchief linen, with a simple folded hem. The tatting pattern is a very simple one from a book that is now in storage, so I can't give you the details. I used DMC Cordonnet size 60 thread and sewed it on with Madeira Cotona size 80 thread, all materials are white. This is the first time I've used this shuttle. It has a bobbin and a crochet hook on the edge. It took me a while to get used to it, but now I love it. 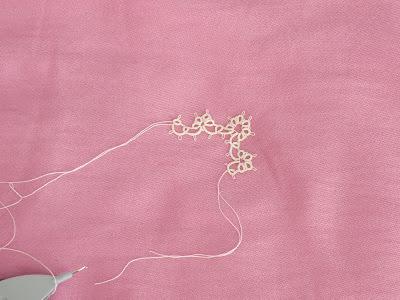 Sometimes I catch the hook on the tatting thread, but I've been diligently trying to train myself not to do this. 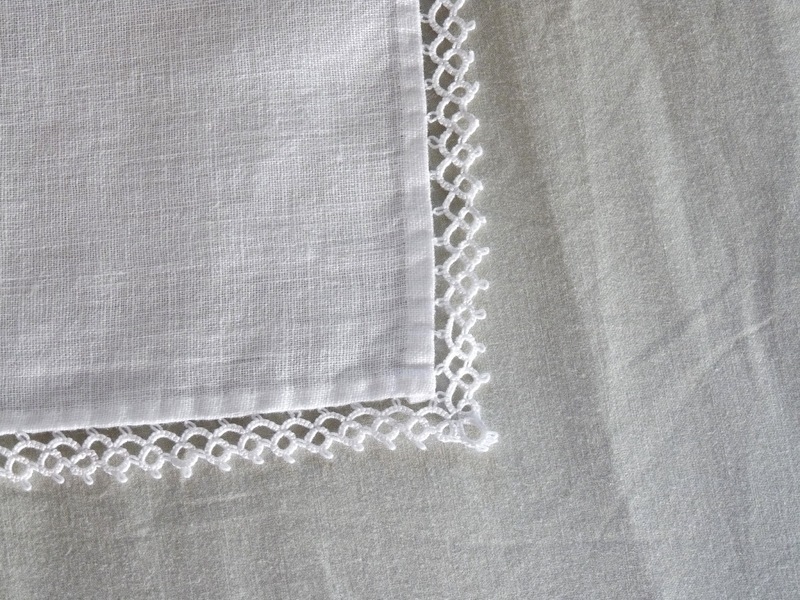 I like sewing the tatting on to the hanky instead of tatting right into the edge. First, it is a bit easier to get to the corner correctly, as you can change the spacing just enough to get it right to the edge without any ruffling. 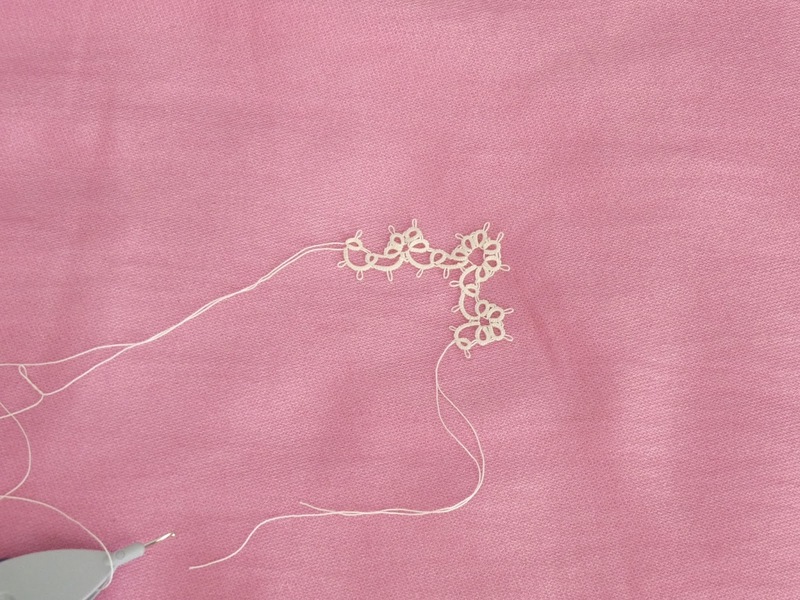 This would be much harder, as least for a newbie like me, to do this while tatting into the hanky. 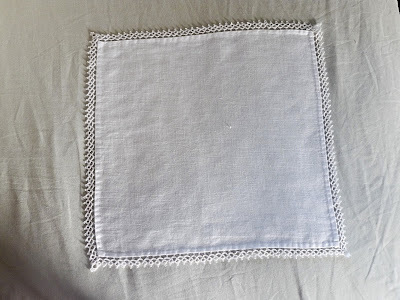 Second, both the sewing thread and the fabric are much weaker than the tatting, so if the hanky gets stained or torn I can easily remove the tatting and put it on another hanky. I learned this from Jeannie Baumeister of Old Fashioned Baby (see the link to her site on my blog list). 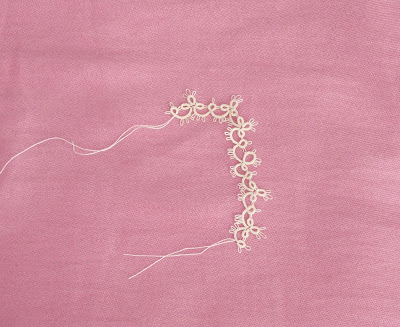 She always uses a very fine thread to attach lace to fabric so if there are any stresses on the garment the thread, not the very expensive lace or fabric, will break and so will be easily mended. I've never tried this to see if it works, but it makes sense! Now it's time to try a more complicated pattern, something with more picots and in a smaller thread. I'm comfortable with size 60 so I'd like to move on to size 80, the really tiny thread. There's been a lot of activity on my new house lately. The tile work is almost complete; it just needs some finishing and the grout. The carpenter is awesome! Look at that stair rail. I found pictures of mantels and had the carpenter make up much simpler versions of the ones I found. I'll show pictures of both of them once the tile is attached and the wood stained. 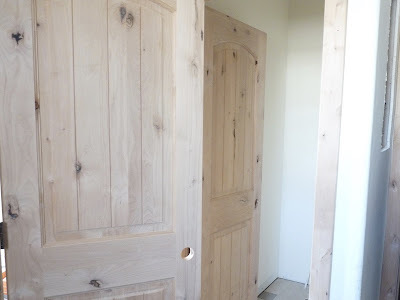 All of the woodwork in the house, consisting of the mantels, baseboards, door and window trim are alder and the doors are knotty alder. Once the stain, Sherwin Williams Cinnamon, goes on they will be lovely. When I went by the house a few days ago I was told that the painters had just come by and took a sample of the cabinets to match the stain. I put a stop to that right away. I spent a fair amount of time picking out the stain so that the doors, trim, cabinets and my existing furniture don't match, but coordinate. I certainly hope this approach works. The master bath cabinets are much smaller than in the previous house. 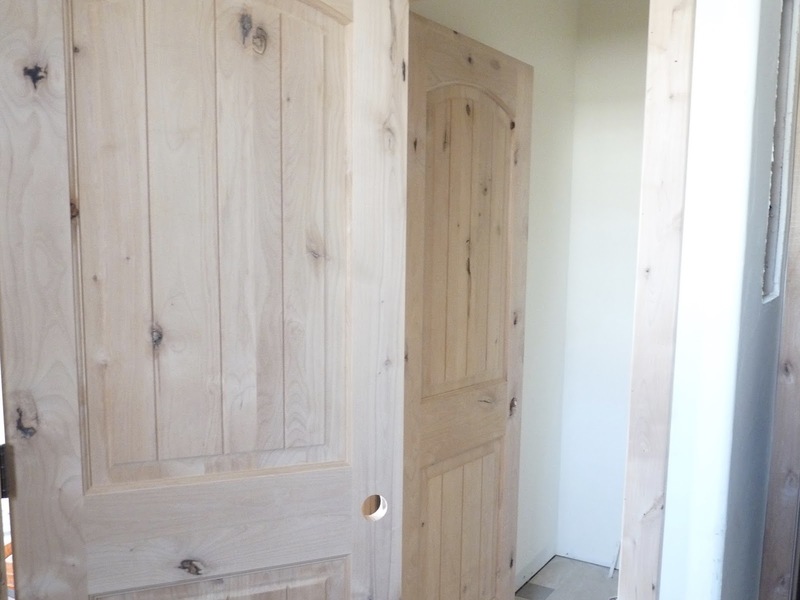 That will take some getting used to, but I'll have a vanity in the walk in closet.